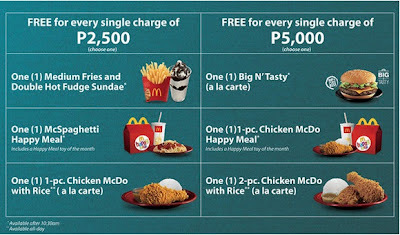 Metrobank McDonald's Treat '12 ~ Philippine Freebies, Promos, Contests and MORE! Can't get enough of Metrobank McDonald's Treat? Last year's treat was exceptional so this year, they bring back the promo with different items to choose from. This time, you get a choice of Medium Fries and Double Hot Fudge Sundae, McSpaghetti Happy Meal, and 1-pc. Chicken McDo with Rice (a la carte) for every P2,500 single-receipt purchase using your Metrobank Card. On the other hand, a choice of Big N' Tasty (a la carte), 1-pc. Chicken McDo Happy Meal, and 2-pc Chicken McDo with Rice (a la carte) is yours for every P5,000 single charge slip transaction.